First you see the Display Settings section, which lets you specify which sections to show in the main body of the notification or ticket. 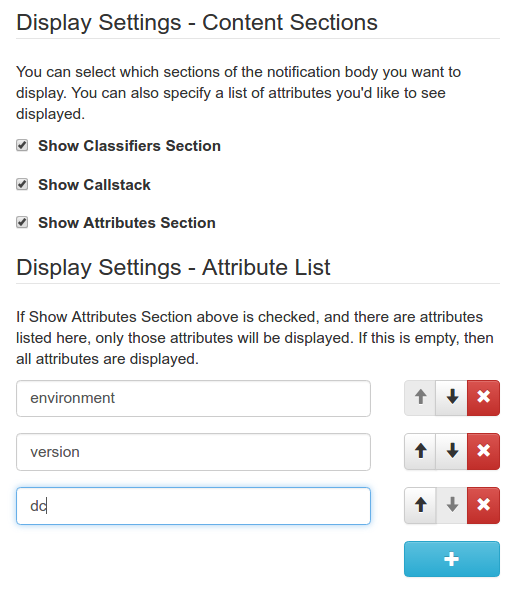 For the Attributes section, you can also limit display to a list of attribute names. Simply add each item you want displayed to the Attribute List section. If this list is empty, then all attributes are displayed if Show Attributes Section is enabled. Here, you can specify whether you would like to see the hostname in the list of attributes. But what's more interesting on this page is the list of Actions. 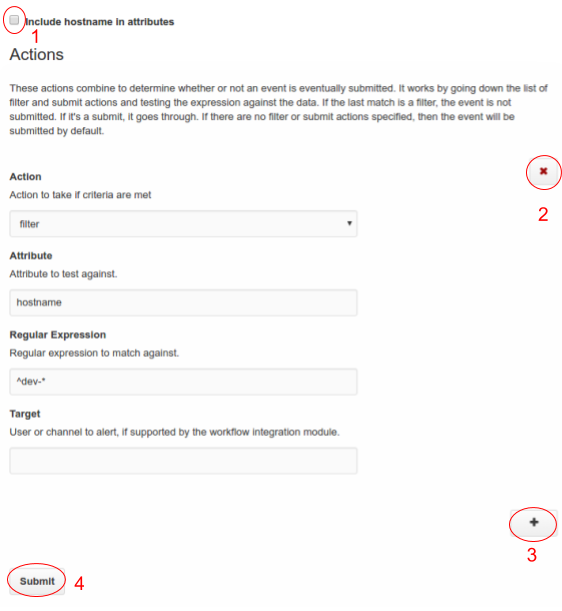 These are lists of actions that you can apply to all of our workflow integrations, and allow you to filter out events based on certain criteria, or add additional text to the output of the event to mention a particular username. This is especially useful for chat-based services such as Slack, where you might want to call attention to a particular username with @username, or something similar. This also works in ticket-tracking services such as GitHub. The ability to use submit or filter actions gives you a large amount of flexibility in determining which events you want to be notified on. By default, all events can trigger a notification. However, if you add in one or more submit or filter actions, you can customize this behavior to only alert you when crash attributes meet certain criteria. If datacenter equals nyc, then "submit" is the last match, therefore the notification is sent. Otherwise, "filter" takes effect. 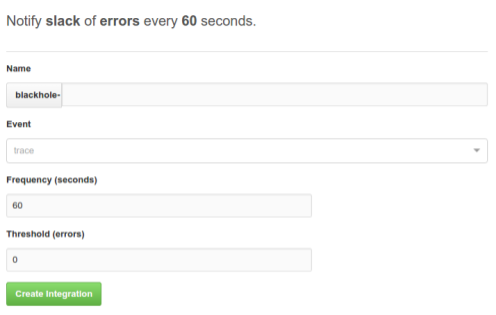 Include hostname in attributes (1): Check if you would like the see the hostname includes in your errors' attribute list. Action: Specifies to submit or filter out the event if certain criteria are met, or to trigger a mention to a particular user. (e.g. @username on a chat service). If more than one submit/filter action is specified, then the last successful match on the list (from top down) takes effect. Frequency: This is the minimum amount of time the system will wait before firing the next event. Threshold: An event will be fired when this number of events has aggregated, regardless of frequency. Enter these settings, click "Create Integration", and you're all done!